Healthcare workers in London and across the country are staging demonstrations against the privatization of the NHS, rallying voters to consider the impact of the election on the health service. Their demonstrations come as an open letter published in the British Medical Journal (BMJ) calls for the next health secretary to do more to prevent further cuts and the privatization of the state owned health service. “We already know millions did not vote in the last election. We want to ensure the launch of this time-limited campaign supported by many national campaigning groups focuses people to vote and to vote for the NHS,” they added. 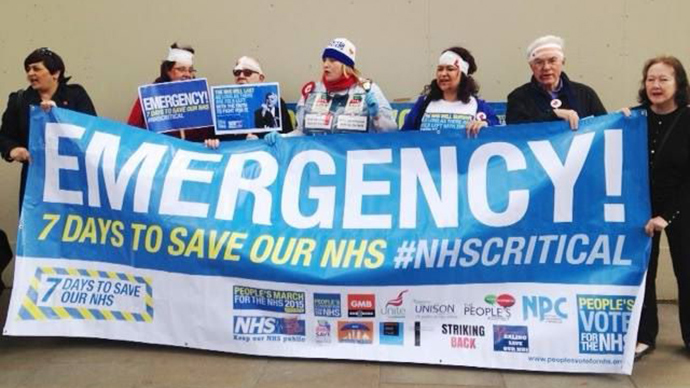 Their campaign coincides with a demonstration by staff at one of London’s biggest hospitals, Guys and St Thomas, who will stage a protest on Thursday evening against further cuts to antisocial hours payments mooted by the coalition government. “We are currently working flat out, missing breaks, short staffed, frustrated by cutbacks in the NHS and attacks on its staff in the media that seek to blame us for the mess the governments Health and Social Care Bill and £20 billion worth of cuts has placed us in,” the organizers said on Facebook. A report by the think tank False Economy revealed this week the NHS has been hit with more than £2 billion in “stealth cuts” since 2010, as the tariffs for procedures have been gradually reduced. A letter from the BMJ published on Thursday echoed the sentiments of the healthcare workers. Signed by the editor in chief of the publication, Dr Fiona Godlee, the letter says the NHS is “stretched to breaking point” and urges the incoming health secretary to “secure” its future. It adds that extreme cuts to social care, have “exacerbated the pressures, causing knock-on effects across the service” meaning waiting times for treatment are the longest in years, with 13 NHS trusts now in special measures, causing concerns for patient safety. The letter explains that under the current NHS chief executive’s five year plan, savings of £22 billion are expected. This level of cuts “will still require efficiency gains never before achieved by the NHS, and a further £8 billion is needed from government by 2020 just to stand still,” the journal claims.